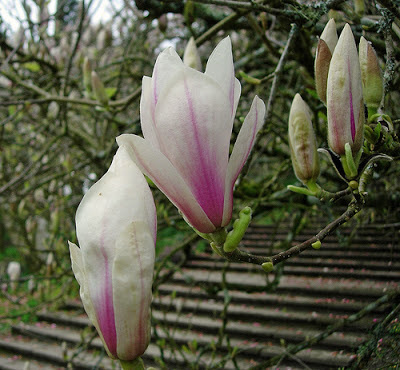 The late spring this year has worked in our favour for visiting some gardens where we wanted to see their magnolias, ericaceous displays, wild flower banks and woodlands, which we only got around to doing in this last couple of weeks. 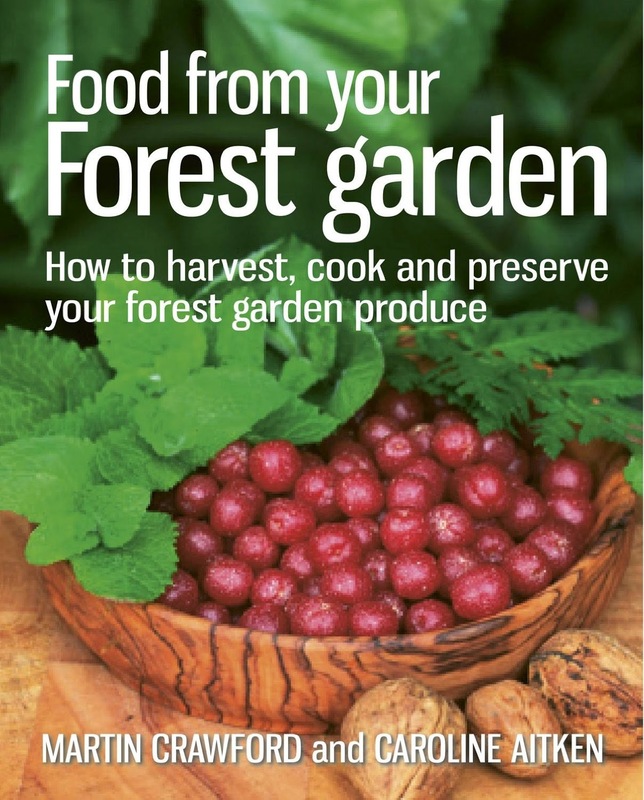 We are lucky enough to live close to Dartington Hall and Gardens near Totnes which has a brilliantly quirky formal garden and woods. It is a small but perfectly formed garden which feels a bit like Capability Brown meets Alice-in-Wonderland! 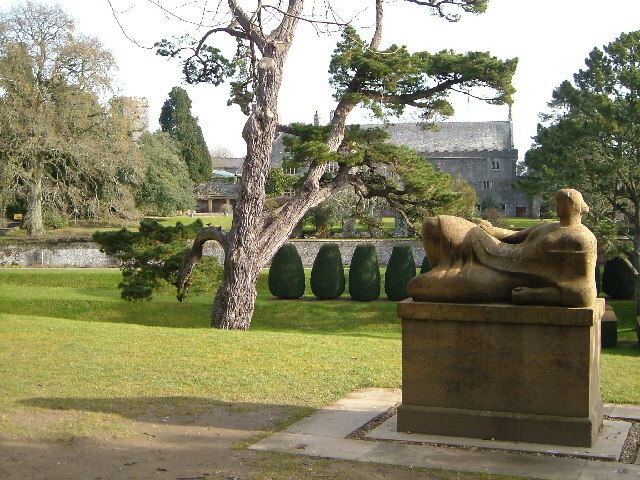 A Henry Moore sculpture with the lawns and hall in the background. beautiful sculptures in the gardens. tea room by the gardeners. Worth a visit at any time of year, it is particularly good in the spring time as they have extensive magnolia avenues, a great collection of camellias and interesting formal landscaping all interspersed with banks covered in primroses, dog tooth violets, cyclamens, wood avons and bluebells. It really is magical. by the wild flower banks. Another garden which most people have rightly heard of is the Lost Gardens of Heligan near St Austell in Cornwall. Where to begin?? It has everything from woodland rides, to jungle boardwalks, walled vegetable and flower gardens and …..best of all: pineapple pits! 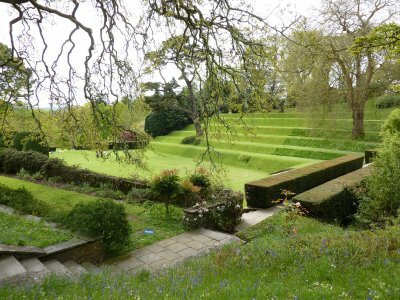 These gardens, like many estate parks was lost to neglect after the first world war and was found in 1990 by Tim Smit- an ancestor of the Tremayne family who started the gardens in the mid 18th century- who began the enormous renovation project. It really is incredible to see what he has recreated with the help of armies of volunteers over the years. gunnera? Oh, no. A blackbird. 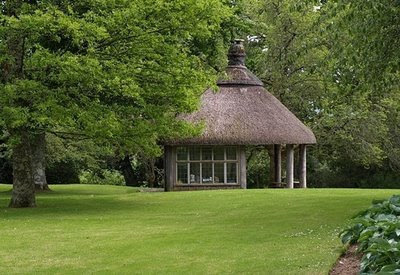 Tim Smit has now passed away but the creativity continues, and these gardens are a must-see for anyone interested in plants, gardens or history. It is also somewhere you can feel safe to appreciate rhododendrons without fretting about their potential environmental impact! Of course, we were drawn to the walled vegetable garden where we admired the complete lack of weeds and the perfection of the espalier, fan and cordon fruit trees....these put the text books to shame! alas I didn't have any to hand. Cordons of mixed apple and pear trees. As an antidote to all of this manicured tidiness we have had many a sunny ramble on our beloved Dartmoor - tended to only by the ponies and shaped by the incessant wind!